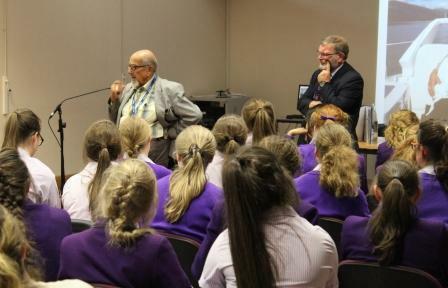 On Wednesday 25th June Year 9 students were very fortunate to hear the poignant story of a Holocaust survivor, 89 year old Harry Bibring. Harry related his story from his early years as a school boy in Vienna to his arrival in England, with his sister Gerty, on the Kindertransport in 1939. This was the last time Harry saw his mother and father. Tragically his father died from a heart attack when he was taken away by the Nazis. His mother then lived with her sister until they were both deported to Sobibor. Harry’s final message to the students to be tolerant of others and accepting of people, irrespective of their race or religion, was hopefully a message they will remember throughout their lives.